Fog and low-lying mist is very common in the Southern Appalachians. It is a product of the rainforest effect. 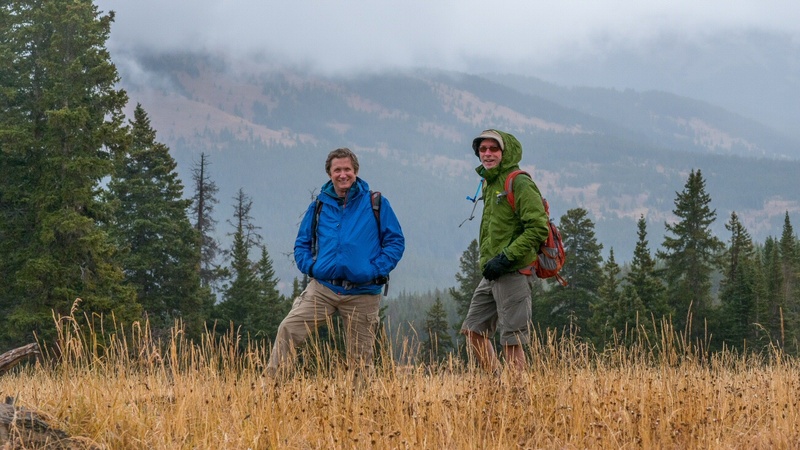 Fog is highly unusual in the Rocky Mountains, but that’s what greeted Dave and I as we hit the trailhead to climb Shrine Ridge. It was somewhat of a dreary, forlorn scene as we walked from mountain bog to spruce forest to high meadow on our way to the ridgeline. Shrine Ridge has wide open vistas of three mountain ranges including Sawatch, Tenmile, and Gore… but not on this day. We visited Shrine Ridge Trail on Friday, September 30, 2016 beginning at 9:30AM and ending about 12:00PM. Our plan was to climb to the crest of Shrine Ridge. When we saw it was socked in fog, we decided to cut the hike short at the meadow below the ridge. Hike Rating: Moderate to the top of Shrine Ridge. Easy to the meadow below. Trail Condition: Since this trail gets plenty of activity, there are lots of volunteer trails about. Watch for roots as a tripping hazard. Starting Point: Shrine Ridge trailhead on Shrine Pass Road. Trail Traffic: We saw about two dozen other hikers on this rainy Autumn day. How to Get There: Travel east from Vail on I-70 to Exit 190 for Vail Pass. Exit here and turn right, heading west, onto the Shrine Pass dirt road (FSR 709). Follow this easy road 2.3 miles to just past the Shrine Pass summit and forest boundary. The trailhead is on the left near the gravel driveway for the Shrine Mountain Inn. It was 35°F. when we arrived at the trailhead, and it remained there pretty much through the entire morning as we hiked. A light drizzle was settling on the willows and spruce as we walked, and it too would persist for the duration. Not what you hope for when you visit the Colorado Rockies, but rain is needed everywhere. That’s why we carry rain gear, right? There is a pit toilet available at the Shrine Ridge parking if you need some last minute relief. The Shrine Ridge trailhead is perhaps 50 yards up the gravel road from the parking area. The first quarter mile of the trail is built up with mounded dirt and gravel. This is a mountain bog area, so perhaps the old trail occasionally got inundated with seasonal wetness. Look for willows along the trail side. They were in catkins phase as we passed in late September. Earlier in the month, these willows would have been displaying bright yellow on their leaves. Mostly brown this day. You reach the bottom of a little drop in the trail and come upon one of the beaver ponds. There are several in the open meadow, but this one is the closest. After passing 1 Beaver Lane, the mounded trail resorts to traditional tread and begins its climb up and into the spruce/fir forest. This is a very popular trail, so the tread is quite worn, and exposed roots can be a problem. Just keep one eye on the ground so you won’t trip or slip. The spruce trees are magnificent, 50-60 feet tall, they remind me of the ones you see brought to the White House lawn for Christmas each year. When the rain would come down a little harder, Dave and I would find a seat on a log beneath the heavy boughs of the spruce waiting for it to abate somewhat. There were more people on the trail here than our previous hike on the day before. We weren’t the only crazy ones out in the cold and rain. One time when we were huddled under a spruce grove, we remained quiet and still as a group of three other hikers passed by. They never had a clue we were there. Makes me wonder how much wildlife I miss on my weekly hiking excursions by simply not being aware of my surroundings. Here we are, comfortable and dry beneath a giant spruce grove protected from the elements. About a mile and a half up the trail, perhaps a little farther, you break the forest and walk into a large mountain meadow beneath the imposing form of Shrine Ridge. The trail continues to the right and then makes a steady climb approximately 2-300 feet to the ridge line. Having been there years ago, I can report that the vistas are remarkable from the crest of Shrine Ridge. From the ridge you can see the Gore Range to the north, the Sawatch Range and Holy Cross Wilderness to the southwest, the Tenmile Range and Copper Mountain ski area to the southeast, and the Flat Top Mountains to the west. It is a wonderful viewpoint. Not so on this day however. The entire length of the ridge was shrouded in fog. We knew it would be futile to climb up there hoping for some views. In fact, the clouds totally enveloped us in every direction, completely unusual for the Rocky Mountains. So we decided to explore the meadow instead. At least a hundred acres in size, the meadow was covered in shin-high (wet) grass. It sits in a bowl beneath the curved wall of Shrine Ridge. This would be a great place to bring your family in summer. Let the dog run free. Throw the frisbee. Put down a picnic blanket. If you come real early in the morning you are likely to see elk or deer grazing in the field. We weren’t grazing in the field, but we did stop long enough to pose for a selfie. 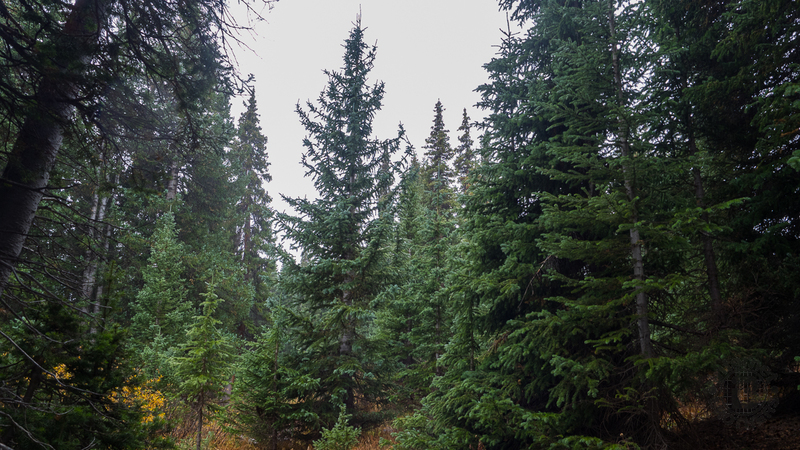 On the way back, we decided to walk through the spruce forest rather than make another pass through the wet grass. We found an ideal log beneath the canopy and enjoyed our sandwiches. The forest floor was alive with a bright green ground cover that was even turning red near the edges of the meadow. Once we got back to the Shrine Ridge Trail, it became immediately evident that several more hikers had joined the fray. We continued to see groups of 2-3 the rest of the way back to the car. There was still no evidence of sunshine, or the clouds trying to lift, so our decision to forego Shrine Ridge remained a good one. When we got back to the car, we continued about another two miles down Shrine Pass Road to a Forest Service pullout with a view platform of Mount of the Holy Cross. Unfortunately, on this day, it too was completely socked in clouds and fog. You can’t win ’em all. Later in the day, 4:00 turned out to be nice and sunny, so I snapped a picture of some cottonwood trees in peak autumn regalia. Summarizing Shrine Ridge, this is an easy hike to do if you don’t go all the way to the top of the ridge. Even if you do, it is still only moderately hard. The meadow below the ridge is a great place for the whole family to spend a day recreating and relaxing. If you make it to the top on a clear day, the views in every direction are what you expect from high mountain hiking in the Rockies. Access is conveniently located no more than a half hour drive from Vail.